The morning after we completed the North Coast 500, six of the seven riders sat around the kitchen table, drinking coffee, eating porridge, and talking through all the different highlights and low points of the weekend we’d just survived. As the conversation rolled along, and we pieced the ride together, reminding each other of conversations half-forgotten, and discovering what had gone on at the back of the pack when we were at the front, I realized time and time again that what set this ride apart from all the others I’ve done was that I’d had six other people to share it with – that it was, unlike most of what I do, a joint enterprise. I thought back to the evening before we started, where we’d all sat carb-loading in Velocity Bike Café, feeling exhausted and unready, and comparing notes on how we always feel exhausted and unready just before a big ride, as if our bodies are trying either to conserve energy, or to convince us that we’re not capable of what lies ahead, and should just give up now and rest, like sensible people. Over the years I’ve learned to disregard this pre-ride sleepiness, reminding myself of the surges of energy I’ll experience once I’m on the bike – but seeing my fellow riders going through the exact same dip made this even easier. Apparently it was all completely normal. I remembered the conversations as we rolled out of Inverness in double file, changing formation every few minutes so that, as in a Scottish country dance, we were constantly switching partners. “It’s a bit like speed-dating” commented Gaby. Five minutes to get to know a fellow rider, before the dance moved them on, leaving you with questions to ask, and threads to pick up again the next time they came around. An hour or two in, despite agreeing that we’d only stop for five minutes every four hours, we were forced to give in to our straining bladders (too many pre-ride coffees), found a sheltered layby, and squatted down in a line, giggling as Laura came round like a valet to offer us toilet paper, and then sprinting together to rejoin those who had carried on. The first time the group lost its tight formation was on the ascent of the formidable Bealach na Ba – a torturous climb on the Applecross peninsula which, with its gradients and hairpins, is comparable to the giants of the Alps and Pyrenees, and offered us a spectacular gateway to Scotland’s rugged west coast. I had climbed the Bealach before, during a sportive last September, and that time it had gone very badly. I was still exhausted from the Transcontinental, groaning with period pains, and lost my momentum halfway up, having to stop and rest and neck painkillers as the rest of the riders soared past. I whispered a toast to absent friends as I rolled over the top, stopped briefly to put my gloves back on, and, a couple of minutes later, cowered slightly as my fellow riders roared past me like an express train rushing through a station, descending in tight formation at speeds that must have approached 50mph. I watched them go, kept my hands on the brakes and kept going, having agreed that the faster riders would stop for a break when they reached Applecross, filling their pockets for the slow descenders, who would just keep riding and be restocked on the move. 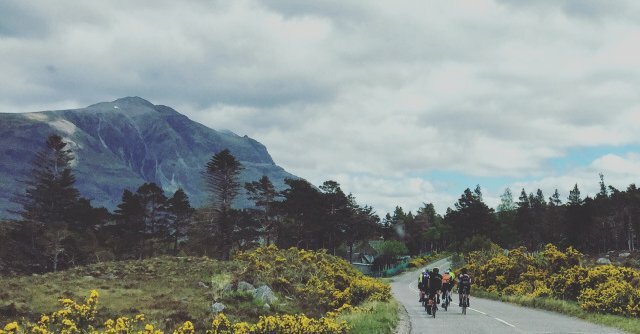 There followed a couple of hours of glorious coastline which, recalling it from last year’s sportive, I knew would offer us spectacular views of nearby Skye, but also relentless ups and downs, each descent thrusting us immediately into the next climb. By now we had lost support riders Gaby and Anne, who had taken a break in order to be fresh to pull us through the night, and waved goodbye to some of the locals who had joined us for the ride out to the coast, then peeled off towards a café (I only partly envied them). But we had gained David and Jenny, members of our support crew whose duties apparently extended to joining us on their bikes, shielding us from the wind, ushering us up the climbs and providing the enthusiasm and seemingly unshakeable cheer that I already knew from watching them both smile their way through 24-hour races. I quickly fell into a rhythm of dropping behind on the descents, then sprinting my way up the climbs to rejoin the pack, before losing them again as we went downhill. I was glad the other riders couldn’t necessarily see what going on, as I was afraid they’d scold me for wasting my energy. I still felt relatively fresh, and my legs were enjoying the chance to push hard for short sections, rather than spinning along in the small ring, as Rickie was constantly reminding me to do. “Chappell, are you in the big ring again?” her Welsh accent would ring out if ever I passed her, or got out of the saddle, or looked like I was putting in more effort than the rest of the gang. And I’d glance down, see that I was, and guiltily click down into a lower gear and sit back in the saddle. 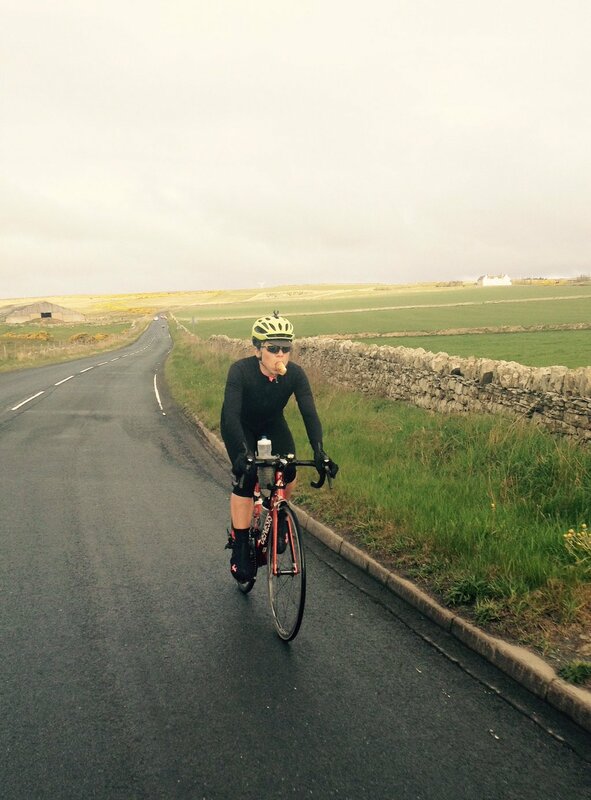 “We’re 100 miles in now” remarked Jo, and we all grappled for a while with what that meant. It was difficult to keep things in perspective on a ride this huge. Despite the big distances I’ve done over the last few years, a century still counts as a fairly big day (certainly enough to warrant an evening of carbohydrate and sloth), but this one had been knocked out before lunchtime, and felt like it was really only the prologue. It was only the prologue – we had four more to do, and each would be harder than the last, as our legs got tireder, our backs got stiffer, and sleep-deprivation played its cruel tricks on our perception and morale. But I found I was also heartened. In the week leading up to the ride I had despaired over how difficult it was to cut this one down to size. If you’re riding 100 miles, you can get to mile 30 and think to yourself ‘there, that wasn’t so bad – and now I’ve just got to do two more of those and I’m finished’. But 30 miles into the North Coast 500, you have another 15 sections like that to ride. (More in fact, since the route is actually 518 miles long.) Even 50 miles in, you still have another nine repetitions to do, and really there’s no comfort in that. But here we were, at 100 miles, and we just had to do that four more times and we were home. Maybe I had it in me after all. I reminded myself of last year’s Bryan Chapman audax (still slightly jealous of this year’s riders, who would by now probably be passing through my hometown in Mid Wales, anticipating the leg-busting Machynlleth mountain road, which is one of my more brutal training loops), remembering that I had ridden just short of 400 miles in 36 hours, and passing the time by calculating that at least seven of those hours had been spent off the bike, eating and sleeping and drinking tea with fellow riders at the controls. If I could ride 400 miles in 29 hours back then, I assured myself, then now, with stronger legs and higher speeds, with a team to spur me on and a generous support crew to keep me going, with no more than five minutes off the bike every four hours, maybe I really could cover 500 miles in 36 hours. Maybe we were actually going to make it, impossible though the task seemed. But my spirits flagged as the afternoon wore on, and I realized I was finally getting tired. Each climb took a little more effort. Every descent was a little more disheartening. The easy conversation that flowed back and forth between the riders suddenly felt like hard work, and I began to sink into my first trough of the ride, hoping I could haul myself out of it before my fellow riders noticed anything was wrong, but struggling more and more to keep their pace. I had been here before, of course, many times. But somehow it never gets much easier – you just dimly remember that last time it turned out not to be the end of the world, so this time it probably isn’t either. I was exhausted. My back complained with every pedal stroke. My breathing deepened, and my legs weakened. I knew I couldn’t go on. I wasn’t even a third of the way into the ride, and I was going to have to stop. I’d overdone it. I’d failed to live up to the impressive standards of my team-mates (all of whom were professional riders or racers with long experience); I was going to let them down; and I was going to disgrace myself publicly by stopping. In my haze of exhaustion, I tried to remind myself of other low points I’d touched. The night I climbed Ventoux last summer I genuinely felt I couldn’t go on, and had no idea how I was going to muster the energy for a 21km push up to the summit. And yet I made it, and I carried on. That hot day, long ago, where I sat at the side of the road in the Chinese desert, with my head in my hands, knowing that I couldn’t go any further, that I’d failed in my attempt to cycle round the world, because right now I couldn’t make it to the next kilometre marker – somehow I’d eventually pulled myself together, and kept going, and things had got easier again. If you just keep going – I told myself, and I’ll tell anyone else when they reach a low point – it’ll be OK, your energy will change, you’ll ride your way out of it. But at this point that’s mere academic knowledge. ‘No it won’t, no it won’t, no it won’t’ responds my body, and I resent my mind’s optimism, as I guiltily resented the enthusiastic supporter who’d cheered me on during a particularly tough section of the 24-hour race I did back in January. “Come on fatbiker – you can do it!” he’d called as I went past. “No I can’t, I can’t. Shut up. You have no idea what I’m going through,” I’d thought angrily to myself as I struggled past him. He was right though. I could and I did. But this time there was a crucial difference. Just as I’d benefited from the shelter and slipstream of my team-mates earlier on in the ride, and just as I’d furtively copied their lines and cadences, enjoying the rare opportunity to learn from riders far more accomplished than me, now I drew on their energy to keep me afloat. By now Anne (that’s Anne Ewing: Commonwealth racer and highly experienced professional road cyclist) had rejoined the pack, and was schoolmarmishly whipping us into order. “Yes!” we alternately shouted and groaned, following her up yet another interminable climb, and trying hard to pay attention to the beautiful scenery that was constantly unfolding around us – the rugged folds of the mountains, the white sandy beaches, the glittering blue sea and the endless golden acres of gorse, whose sweet scent drifted constantly over us and remains my abiding memory of the ride. My dark patch persisted, and I watched all of this as if from the end of a long tunnel. Conversation failed me, and I listened gladly to Rickie’s chirpy non-stop monologue as she rode behind or alongside me. Friends of hers had laughingly warned us that she wouldn’t shut up for the entire duration of the ride, and sure enough, she didn’t. But this wasn’t annoying in the slightest – in fact, it was encouraging, and reassuring, and gave me some small distraction from the heavy, stubborn reluctance of my arms and legs. I listened to her talking about rides and races she’d done in the past – reminiscing over the Transcontinental with Gaby, and comparing notes on 24-hour mountain-bike races with Zara and Jo – cheerfully describing the times she’d struggled, and crashed, and wept, and vomited, and tried to tell myself that it was OK to suffer, that it didn’t make me weaker than my team-mates, and a failure, that they had all been there too, many a time, and come through it, and triumphed. “Anyone hungry?” called Anne, and radioed to the support crew to arrange a four-minute break. The ambulance we’d borrowed from Torridon Mountain Rescue roared past us with a wave and a toot, and shortly afterwards we saw it parked up ahead of us, with our kit bags and food boxes lined up neatly along the grass verge under the sinking sun. It’s surprising how little you can get done in four minutes, and by now we’d all learned to plan our breaks meticulously as they approached, writing ourselves detailed mental lists as they approached, so as not to waste a single second. And then the countdown would end, and we were rushed back onto our bikes, wondering where the time had gone, and thinking ruefully of all the other things we could have done, had we only had another minute, only had another 30 seconds. I had planned myself a full change of clothing for this break, knowing that it was our last before night fell and the temperature dropped. I ran over where my baselayer, ¾ tights and long-sleeved jersey were in my bag. I planned that I’d strip my torso first, put the baselayer and jersey on, then quickly step out of my bib shorts, wet-wipe my saddle area, and pull on the brand new tights. Then I’d go to the loo, fill my pockets, and get back on the bike. This plan fell apart as soon as I stopped, and realized I was in even more of a state than I thought. I managed to get my baselayer on, then discovered I couldn’t get my shorts past my overshoes, and hopped and trembled on one leg as I fumbled with the zips and tried to wrench them past my shoes. Jenny lent me her shoulder to lean on, and helped me out of my shoes like a tired infant, discreetly averting her eyes as I changed one pair of shorts for another, and handing me a couple of wetwipes to clean myself. Clumsily, I tried to turn my overshoes the right way out, and force them back on, shaking uncontrollably as I staggered from one leg to the other on the uneven verge. Tom abandoned the bikes he was checking and came over to hold me up as Jenny refastened my shoes and overshoes. Dimly, I registered that Kirk was standing in front of me with the film camera, but I didn’t have the energy to object, or complain, or do anything other than notice. In some faraway part of my brain, it occurred to me that this episode would make extremely compelling footage, and wondered if it would make it into the final film. “I need… I need… I need to pee.” All around me, with what looked like improbable speed and grace, my fellow riders had disappeared over the verge, done their business, pulled their shorts back up and were now leisurely stretching and picking through the contents of their food boxes. “No – no – I’ve got to go. I’ve got to go” replied the feeble, histrionic person who seemed to have taken over my faculties. I noticed that Tom, beside me, was mistakenly filling the pockets of the jersey I’d just abandoned, but couldn’t find the words to tell him he was wrong, and that I was wearing a different jersey now. I saw that he’d opened the packaging on the malt loaf he’d just given me, so that I didn’t have to struggle with it whilst riding along, and this thoughtful, considerate gesture rocked me even closer towards tears. I forced my shivering hands back into my gloves, and (with some effort) swung my leg over my bike. The other riders were already setting off. “It’s OK, Emily, it’s OK” Jenny reassured me. “Take your time. We’ll draft you back.” She and Tom fished my food out of one jersey, packed it snugly into my back pockets, gave me a reassuring pat on the back, and sent me off. The mechanics’ van was waiting up the road, and I tucked in behind it out of the wind, gradually working my way up to a sprint as we gained on the bunch ahead of us. Eventually the van pulled out, and I shimmied up the inside of it and found myself once again at the back of the pack, tucked in beside Jo, with Rickie’s orange jersey up ahead of me. “Yep. All good” I told her, trying to make my voice sound firm and strong, as if everything was perfectly under control. The legs of my shorts were twisted and sitting at different heights on my calves, and the waistband dug uncomfortably into my stomach. I shifted around, fidgeting in the saddle and twisting from side to side, trying to get everything in place. It was going to be a long night. But I knew that once darkness fell, things would pick up. When we planned out the ride the day before, we’d discussed our respective rhythms: the times of day when our energy flags, and the times we’re most likely to fly. I’d warned everyone that I tend to get two small dips during the night, one just before dawn, and one around sunrise, where my eyes start to droop uncontrollably and I usually end up having to lie down in a field for ten minutes. Now I remembered that I often have another low point as the sun sinks (perhaps subconsciously despairing that the day’s coming to an end and I still haven’t reached my destination), but that my spirits then soar as the darkness sets in, and I realize I have the whole glorious night to myself, and nothing to do but ride. Jo, it turns out, was virtually the opposite. She told me one of her favourite times was the early evening, when she felt the satisfaction of having had a good long day on the bike and still having further to go, and that she would then struggle with the cold and the darkness. We would complement each other well then, I thought. And sure enough, she seemed to sense I was struggling (given my theatrics during the break, perhaps it was now obvious), and turned to check how I was doing, reassured me it would be OK, asked me if it would help to have a chat. I was trying to collect the words to tell her that I didn’t think I was capable of holding a conversation, but that I appreciated her concern, when suddenly there was a disturbance in the pack ahead of us. I still can’t quite remember how the crash happened. What we’ve pieced together is that, as we crested a climb, Rickie and Zara accidentally wobbled towards each other and touched wheels. I remember seeing Rickie crash to the ground ahead of me, and then, with the same horrible inevitability I’ve felt as I watch Tour de France pile-ups on TV, I realized I had no time to stop and nowhere to go, and watched myself ride straight over her, flying off the bike and coming to a very hard and sudden stop as the tarmac rushed up to meet me. I attempted to straighten my twisted limbs, and felt a nauseating wave of pain roll up from my knees. But they still moved. “I’m OK – I’m OK…” I gasped. I heard someone pick my bike up from beside me and move it to the side of the road. Over my head was a blur of golden sunlight and anxious faces. Someone dragged me into a sitting position, and I was aware of someone else – possibly Zara – standing behind me so I could lean against her legs. I looked at my knees, noticing with detached amusement that I’d put a hole in my new shorts after only a couple of miles’ wear, and thinking that their rather superficial grazing said nothing of the searing agony that emanated from each kneecap as I flexed them. My vision started to blur. “It’s a bit late for that love,” grinned Lee, leaning over me as I lay down on the floor again. “We’re going to have to go” someone said, and I saw legs swinging over bikes and heard feet clipping into pedals as the team reassembled and turned their attention back to the task at hand. They pulled me to my feet, and held me up from both sides as I shuffled back towards the film crew’s camper van, which had pulled up behind me. “How’s Rickie?” I asked, then remembered I’d already said that. And she was back on her bike now, so she must be fine. They laid me down in the back of the van, wrapping me in down jackets and sleeping bags to stave off the uncontrollable shivering that overtook me as the shock set in. For a while I thought I’d be sick. Then I thought I’d cry. Then I tried to cry, remembering that this is one of the ways of forcing the shock through your system, but all I could get out were the same stilted whimpers, which rose to moans as Lee gently rolled up my tights to inspect the damage, rubbing Happy Bottom Bum Butter onto my swollen flesh, in the hope that the clove oil it contained would anaesthetise the pain. I couldn’t quite understand why I was so shaken. I thought back to the times I’ve crashed and leapt back to my feet the moment I hit the road, only realizing hours later that I’d broken a bone, or mangled part of the bike. Where was my usual surge of adrenaline? “What am I going to do?” I moaned. Lee leant over me. “No, this ride’s over for you,” she said. “Rest up now.” And she went off to rest up herself, in preparation for the night shift. There followed what I inevitably describe to myself as a Long Dark Night of the Soul. I was stowed away in the upper berth of the camper van like an unwanted suitcase, and spent the next few hours in an uneasy limbo – too exhausted to remain fully awake, but so constantly thrown about by the movement of the van that it was impossible to fall asleep. Every time we went round a bend or over a bump (an all-too-regular occurrence on the North Coast 500) I was tossed to one side or another, sliding over to the right as the van veered left, and then abruptly jerking back as it righted itself. Once or twice we stopped suddenly and I was jolted into consciousness as my head thwacked against the wall or the ceiling. Sometimes the van seemed to drop like a stone along a rocky track, and I lay there with my teeth rattling, wondering fearfully if Lindsey had fallen asleep at the wheel, and we had veered off the road and were shortly to plummet over the cliffs and into the sea below. My back, sore from over 200 miles of constant riding, ached and groaned with every movement. I experienced once again the mysterious chest pains that plagued me on the Transcontinental, and which seem to flare up whenever I lie flat after a long period of exertion. And every few minutes a hot wire of agony would crackle through each kneecap. But the real agony was mental, as it always is. I hadn’t had a chance to ride out of my dark patch, and so I stayed in it all night, riding its downward spirals into the very depths of misery and despair. I tortured myself with thoughts that I had failed, that I had let down the team I was supposed to be part of, and that here, after all, was the ultimate proof that I just wasn’t good enough to ride alongside such athletes, and to complete the task we’d set ourselves. I remembered our planning meeting, where Lee and Rickie nominated me as one of the riders the team would aim to support round the entire course. But she was wrong. I wasn’t and I couldn’t, and now everyone would know, and they’d be disappointed in me for failing to live up to the person they thought I was. I wasn’t even good enough to support the other riders – I was now effectively dead weight; just a motionless body to be transported round the remainder of the route, taking up the space in which a more useful rider could have been resting. I thought about asking the van to stop right then and there, and getting out to make my own way home. I decided I’d slip away as soon as we got back to Inverness, and hide somewhere until my train left, and avoid being seen in any of the post-ride photos. I wished I could somehow erase myself from all records of the ride, all the footage and stills Kirk had taken, all the conversations and songs and in-jokes, so that it was as if I’d never been there in the first place. Why hadn’t I just got back on the bike? I asked myself. Why, why, why? Was it that I was too weak to go on, or was it that I was actually lazy, and had wanted to give up? I thought guiltily of the small seed of relief that had nestled in amongst all the other emotions as they put me in the van. I thought back to the Transcontinental, which I had abandoned under similar circumstances. What if I’m actually just not good enough? I wondered. What if I’ve finally set myself a goal I’m not capable of achieving? Every now and then I was aware of the remaining riders alongside the van, only a foot or two away from me, yet also in another world, as they sped laughing through the cold night air and I lay heavy and motionless under my sleeping bags and blankets, drowning in self-pity. Once or twice I overheard conversations over the radio, or heard Kirk and Lindsey chuckling as they eavesdropped over the radio mics. Apparently the team was doing well, and the conversation was descending into obscurity and obscenity as the night wore on. I cringed with reluctant envy, knowing that I was missing my favourite part of any ride, knowing that I’d have come into my own as the sun set, and that now, had things been different, I’d have been laughing and singing alongside them, sharing the suffering, boosting them through the low patches and being boosted in turn. I’d removed myself from the peloton just at the point at which I was about to prove most useful to them. I should be out there riding, not here in the van, groaning once again as my back twinged against the hard sleeping platform and the pain sang through my knees. I even envied them their suffering, because at least they were suffering with some purpose, and deserved some sympathy, whilst here I was suffering for no reason at all. As dawn broke and the sky turned grey, the storm in my mind began to blow itself out. I couldn’t say I perked up, but my self-loathing began to lose its momentum, and I dispassionately considered what my next move should be. I couldn’t stay hidden up here in the roof for the rest of the ride. Perhaps the best thing I could do would be to go and join the support crew, most of whom had ignored our instructions to get at least a few hours’ sleep, and would doubtless be in need of relief by now. I struggled down into the main body of the camper, just in time for it to draw alongside the riders, Kirk hanging out the passenger window with his camera and mic. “How’s it going?” he asked them. “She’s right here,” said Kirk, gesturing towards the back of the van. We radioed back to the mechanics’ van for my bike – which luckily turned out to have survived the accident unscathed – and I told the crew I’d spin along in a low gear for a while, just to see how it went, and that if I couldn’t turn the pedals, or keep up with the team, then I’d get in the support van and start making sandwiches instead. But I might have known that on the bike is where I’m supposed to be. As soon as I clipped my feet into the pedals, I was back in my element. My mood lifted as my legs began to spin and my lungs sucked in big hearty draughts of the fresh early morning air. We were crossing the north coast of Scotland by now, heading for John O’Groats, and to my left towering cliffs gave way to a pale blue sea that stretched out towards the pale blue sky, nothing but a few invisible islands separating us from the very top of the world. Cautiously, but with growing excitement, I clicked back up through the gears and began to soar along the long deserted roads, my knees miraculously pain-free as I sprinted to rejoin the pack. There were subdued celebrations as I reached them. They were pleased to see me, but most had had a very hard night. Zara was almost catatonic with pain and fatigue; Jo was frantically grasping at any conversation, joke, song or game to distract from her suffering – only Rickie seemed untouched by the darkness, still chattering on to anyone who’d listen, giving us all a welcome respite from the gloom and tedium of the road. I felt momentarily ashamed of my still-strong legs and soaring spirits, but then realized I was now more useful to the team than ever – that I could become one of the support riders who towed them home. So I tucked myself on the front next to Lee, put my head down, and powered on into the rising wind. When we reached Thurso, our spirits were boosted even more by the sight of a lone cyclist up ahead of us, one foot on the pedal, one foot in the verge, gazing back up the road behind her, waiting for us. We had company. A spontaneous cheer broke out as Debbie joined the bunch, and we were even more delighted when her story was passed up and down the line – she was the only female cyclist in her local club, but she’d heard we were coming through, and made arrangements with a few more women down the coast in Wick to come out and join us. It would be the first time any of them had met, and also the furthest Debbie had ever cycled. And this, we proudly told each other through our insomniac haze, was exactly why the Adventure Syndicate was founded. It was already working. We were succeeding. Debbie led us down the half-mile detour to John O’Groats, where we were cheered by a few early tourists, who probably assumed we had just ridden up from Lands End, and were puzzled when we then turned around and carried on south. And then we were in the home straight. But what a long long home straight it was! We still had well over 100 miles to go, and although 100 miles suddenly sounds much less when you compare it to the 500 some of us were riding overall, put another way, to ride 100 miles having already ridden 400, and been on the bike for 24 hours almost without a break, sounds (and feels) humanly impossible. Rickie and Zara and Jo were flagging, struggling up the hills and stopping for ever more frequent toilet breaks as their stomachs rebelled against a day and night of sugary energy products and constant exertion. The rest of us rode alongside them to shelter them from the wind, drafted them back to the pack when they fell behind, and took turns at the front, frequently being asked to “just ease up a notch please!” The road became broader and busier, and the “gentle undulations” Lee had promised us for the final section actually turned out to be 14% climbs. Jo and I compared notes on our various low points – during this ride and during others. As well as the 24-hour mountain bike races I’d previously encountered her in, she turned out to be a veteran of numerous multi-day adventure races, and was no stranger to the dark places to which such exertions can take you. Unlike me, her strategies for coping with them were far more clearly formed. She would reach out to fellow sufferers, entreating them to join her in a game, or a burst of tuneless singing. She would try to replace every negative thought in her mind with two positive ones. She would concentrate on how much she wanted to be here – right here, right now, on her bike, in these beautiful surroundings. She would think carefully about how she’d feel if she did give in and go and sit in the van. Listening to her, my sense of shame at my own weakness began to slip away. I had tried to conceal the fact that I was struggling the previous evening, worried that my team mates would think I was weak, and be disappointed in me, or start to consider me a tiresome drag on their own efforts. This wouldn’t have been the case at all, I now realized. They had all been there themselves, many times. They would have ridden shoulder to shoulder with me, and helped me through it, and rejoiced alongside me when I got back into my stride. And now, having been there myself so recently, I was in a position to help them through their own darkness. My energy flagged slightly as we passed the sign that told us we were 80 miles from Inverness (as a matter of fact, various detours would make it about 20 miles further, but we didn’t know that at the time), but my sleepless night in the camper van seemed to have been more restful than I realized, because this trough was only a shallow one, and I found I could easily keep going. Our spirits were buoyed by the indomitable David and Jenny and Fraser, who rejoined us from the support crew, and by cyclists up and down the coast who lay in wait for our straggling peloton, and were invariably greeted with cheers as they joined the back of the line, and then gradually worked their way forward to take their turn in the wind for a while. Ten miles from Inverness Castle, we realized it was already 5.35, and we had pledged to be there for 6pm, if we were to hit our target of completing the ride within 36 hours. But to ride 10 miles in under half an hour would be quite a task even with fresh legs, and Rickie and Zara and Jo were by now crawling along at around 12mph, longing for the ride to be over, but unable to turn their legs any faster. For a few minutes we carried on, knowing that we’d probably still make it in record time, even if we didn’t quite achieve our 36-hour goal. And then, like a sprinter emerging from the bunch for a stage victory, Rickie was off, teeth clenched as she raced through the pack, Zara and Jo clinging onto her slipstream. The rest of us sped up to catch them and hastily arranged ourselves ahead of them, marshalled by the ever-capable Anne, who coached us along in a through-and-off formation, six of us rotating positions at the head of the pack, creating an almighty slipstream that (the support crew later told us) pulled the whole team along at speeds in excess of 30mph. We stormed through the outskirts of the city, we jumped a red light as we approached the River Ness (oops), and at one minute to six we were powering up the final hill that led to the castle. The clock ticked over to six just as we were unclipping our feet from our pedals. We had made it. And we have achieved exactly what we set out to do – to the minute. We all fell apart slightly after that. Our disciplined peloton now became more of a pile-on, as the riders crowded together and hugged each other in turn. People ran in and out with cameras. Rickie lay on the ground. I climbed off the bike and discovered I could no longer bend my knees, so found a wall and lowered myself to a sitting position using the strength of my arms. We beamed at each other, and one or two of us wept. Someone handed us a bottle of champagne. And eventually we repaired to Velocity Bike Café for a much-needed cup of tea and plate of vegetables. I sat in the corner, icing my knees and watching the others grin and stumble their way through their post-ride glow. My own was curiously absent – just as the adrenaline surge had been after my crash. I was pleased to have finished, and very happy that the team had achieved what we all secretly feared might be an impossible goal, but I couldn’t summon the usual warm hormonal satisfaction of having exhausted myself completely. I had finished the ride with energy still in my legs, and felt secretly guilty for not having given more – even though a gentle rolling pace was all the lead riders could handle by the final 100 miles. And I hadn’t exceeded what I thought I was capable of – I’d effectively just done two consecutive day rides of 250 and 150 miles apiece. It was – and still is – difficult to remember that this still entitled me to feel exhausted, and proud, and satisfied. I remembered again my father laughing at my fears, pointing out that no matter how impossible I think something is, I always seem to come out on top. Well, this time I hadn’t. And it was a difficult lesson to learn, but also an important one. After all, if you always come out on top, maybe you weren’t aiming high enough. Last year I had a run of successes, and enjoyed the sensation of everything I touched turning to gold; of realizing I’d become the person I always wanted to be. This year I’ve aimed even higher, and discovered that I’m not quite there yet. But what I’m going through currently is a much more rich and complex learning process than it would be if I just progressed in leisurely and linear fashion, regularly ticking off achievements as I’m ready for them. I’m learning (reluctantly) about the mechanics of failure. I’m discovering that what causes me to give up, rightly or wrongly, is not necessarily the crash or health scare that I end up blaming, but the fact that it occurs during a period when I lack the resilience to deal with it. (I have no doubt that if I’d crashed a few hours earlier or later I would have leapt to my feet and got straight back on the bike.) And these lessons will strengthen me for future dark moments when I think I really can’t go on, and am offered an exit – but somehow manage to turn away from it, and keep going. What’s more, I’m learning that the horrendous lows I experience during my longer challenges aren’t a sign of my personal weakness, or a guilty secret that everyone else would be appalled by. Everyone else on this ride went through their own dark patches – Zara’s lasted nigh on 17 hours – and we dealt with them together, those of us who were feeling energetic helping to support those who were struggling, and distract them from their downward spirals. It was as if the invisible peloton I had imagined on my way up Ventoux had come to life, and was riding all around me, taking it in turns to lead the way. And I’m learning, of course, that much as I enjoy solitude, there’s a certain delectable magic to riding alongside other people. Despite its hardships, none of us wanted the weekend to end, and as I drove south with Zara and Jo the following day, reminiscing about what we’d all been through, comparing scars and planning our future challenges , I found myself wishing I was back on the road with them all, laughing and groaning and singing and telling stories, as the calves of my team mates twinkled ahead of me in the sunlight and the scent of gorse drifted over us. You can read Lee Craigie’s write-up of the weekend here.